+ just got the new issue of 'sunset' magazine ["the magazine of western living"], and in a sidebar was a bit of info i had to share. you know those little stickers on fruits and vegetables, that you must peel off before eating? ever wonder what the numbers mean? besides price, it also tells how the item was grown. a "9" means organic ["94133"], an 8 means genetically-modified ["84133"]; conventionally grown seems drop the first .php# [they use "4133" as an example]. another oddment for the dm! collection. 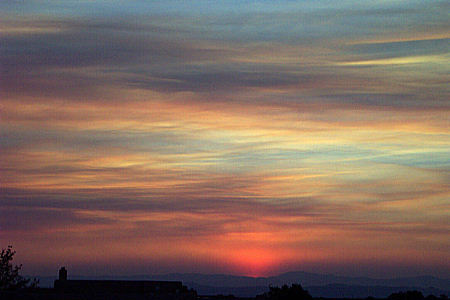 + because of smoke, a scuzzy pink/orange sunset. blech. + sign on san diego: the last bastion of original volkswagen beetle production, mexico, is looking to finally end the production run. "i think it was even noisier inside the car than outside, and that was noisy." the joys of an air-cooled engine. well, try taking the muffler off a wankel sometime ... on second thought, you'll sue me for loss of hearing. don't. + sacbee: george f. will, proof of wmd's is crucial. "but unless one is prepared to postulate a u.s. right, perhaps even a duty, to militarily dismantle any tyranny - on to burma? - it is unacceptable to argue that saddam's mass graves and torture chambers suffice as retrospective justifications for pre-emptive war." mr. will is hardly a liberal, note. and comparisons to f.d.r. 's statements, as postulated in a weekend ny times piece, are not equivalent. the nature of the threat, and military parity, are totally different. + eweek: pentagon reviews data mining. on t.i.a. - "such mission creep is likely to expand the uses of the program past terrorism to the war on drugs or other high-profile criminal investigations. it is equally predictable, t.i.a. opponents say, that the same will occur with the amount and type of data sought, likely leading to an increasing burden on private-sector database operators." + courier-mail.au: putin pulls plug on media freedom. could be political, and it's worth watching the actions of our allies ... yes? + voices from the south: the third world debunks corporate myths on genetically engineered crops. pdf's, i haven't had the opportunity to do anything but skim yet ... but i see good points within. + deutsche welle: u.s., e.u. to seek carbon dumps to fight climate change. i'm really skeptical about carbon dumps, i have to say. + the korea herald: world's largest landfill powerplant to be built. tapping the methane gas created by the landfill, to create electricity. + guardian.uk: i'm not sure if everyone will agree that opera is good for headaches ... and other things. + nrdc earth action center. remember to send as a fax. physical paper still gets more action, or so we discussed in weblogs eons ago. + earth-info has another good one. + and yet, what i wrote below is wrong. mom & pop restaurants are not 'adventure' ... they *were* the norm, once upon a time. certainly chains are no cleaner or healthier, tastier or creative than independently-owned establishments. maybe it's the attraction of ordering, and receiving, a 'consistent' meal ... anywhere in the united states. guaranteed mediocrity, versus risking the surprise. later: in matters of local foodstuffs, i always defer to mr. least heat moon. "blue highways." read it, and you'll understand my position a bit better ... and contemplate many other important things about america. + ny times: signals from nowhere. and not just radio stations. when i travelled the country, doing industrial theatre, we constantly lamented that one had to drive further and further out from cities to find the mom & pop, local cuisine restaurants. over the weekend, i overheard some locals celebrating the arrival of 'chilis' to santa fe. welcome a chain southwestern restaurant to the home of original southwestern food? sometimes, i just don't understand my fellow citizens. i really don't. i chalk it up to a fear of the unknown, a desire for consistent and safe experience. take the boring life ... i'll have the adventure, with a side order of posole, please. + the spectator: language barriers. yep, we've seen quite a bit of this: "words falling upon the facts like soft snow, blurring the outlines and covering up all the details ..."
+ boston globe: critics say the islamic world needs its own enlightenment. but just how enlightened was our own? "... good enlightenment figures like jefferson, kant, and hume had what by today's standards are extremely distasteful views on 'inferior' (e.g., nonwhite) peoples. far from being a movement of freedom, enlightenment was a tool of hegemony and social control." but then, enlightenment was always a product of its times. one must be careful of ethical relativism. + spiked: harry potter and the 'culture of infantilism.' why blame rowling for the decline in cultural 'age'? it's a symptom, not the disease. + washington post: the artifact count is up to 6,000. and the 'verified' number is expected to rise. there's a new story getting linked to this, haven't seen it in major news rags yet ... that the u.s. didn't protect the museum because it was a "sniper nest." i only started seeing the references yesterday ... convenient, eh? + ny times op-ed, herbert: the money magnet. "... fat cats throw millions of dollars at the president to reinforce their already impenetrable ring of influence around the national government." still feeling patriotic? + ny times: effort to equip libraries with internet filters, is allowed. + ny times: west nile virus, in a few short years, has now spanned coast to coast, it seems. + ny times: innocence of youth is victim in congo war. + ny times: more companies pay heed to their 'word of mouse' reputation. the nascent fine art of 'online reputation-building.' weblogs will wield power, here. + santa fe new mexican: bats beset albuquerque parking garage. i bet the bats prefer the cool concrete, don't you? + santa fe new mexican: health care costs worry new mexican employers. 15% a year? when it begins to match my mortgage, it will have to go. + santa fe new mexican: solstice brings the hopi home to chaco canyon. note that the ruins are maintained in good shape by the tribes, not by the park service. it's a matter of faith ... and reverence for the past. 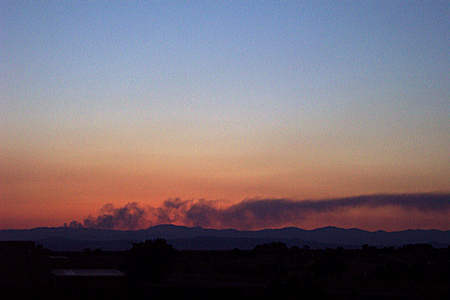 + santa fe new mexican: looks like i spoke way too soon about forest fires the other day. two clear days, a few fires. got a photo of the virgin fire in the jemez, as the sun set yesterday. the mcclure fire, in the santa fe watershed, is invisible from my house. and the barro and monument fires are a bit too distant to view. but the air is dry, the distant vistas are obscured by smoke. can't hardly see the sandia crest today. + cnn: students getting out of cars, onto sidewalks. geez, man ... even with a couple of miles to walk, the only time i ever got a ride was when it was below 0 degrees, or raining cats and dogs. but i've mentioned before, looking through my old yearbooks, kids we [as a group] thought were 'fat' would be considered 'normal' today. + cnn: heart disease diagnosed by dentist? use floss. or at least, toothpicks.